We all need those warm winter woolies and cosy accessories in the cold, but why not experiment by combining soft textures with contrasting materials for a new seasonal direction? Soft, fleecy fabrics and faux fur are everywhere this winter. Try textured jumpers and teddy bear coats for that warm huggable feeling. Alternatively, go smooth with your pullovers – try 1960s style ribbed roll neck jumpers and 1990s favourite chenille for that soft yet silky effect. Fluffy jumpers mixed with faux leather creates a contrasting and eclectic combination that is bang on-trend. 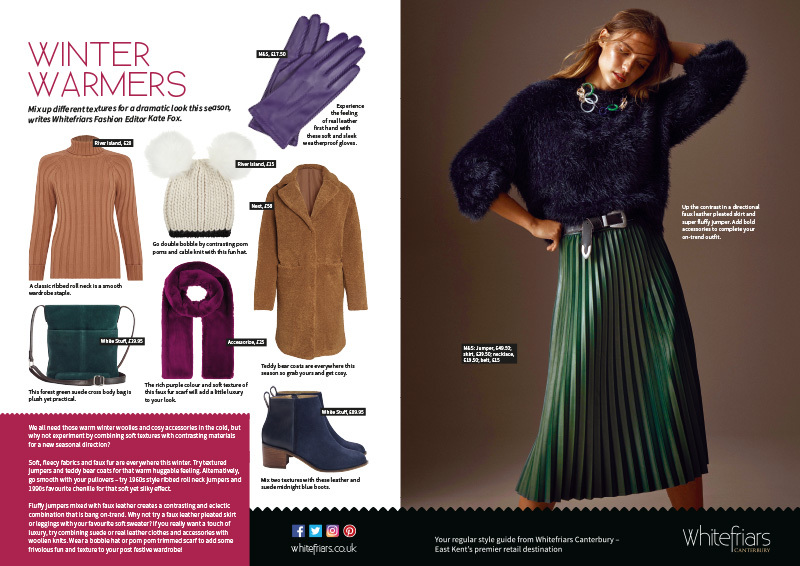 Why not try a faux leather pleated skirt or leggings with your favourite soft sweater? If you really want a touch of luxury, try combining suede or real leather clothes and accessories with woollen knits. Wear a bobble hat or pom pom trimmed scarf to add some frivolous fun and texture to your post festive wardrobe!